There are many files on the modern lutherie market for cutting slots in nuts and bridges, but most only became available years after I was doing this work. My background is in goldsmithing, and I simply adapted the tools and techniques I learned as a jeweler to work on musical instruments. Having had the opportunity to try the commercial fine file sets for luthiers, I haven't found any of them an improvement over what I use. Perhaps if I was in a production situation—doing the same setup over and over, day in and day out—things might be different. Perhaps if I hadn't evolved my own methods with the tools that were available to me back in 1960's, I'd make use of them. In any case, I can do any slot there is with one of these tools. As in many other realms of lutherie, it's not the tool that does the work, but the person using the tool. I've seen plenty of really bad nuts and saddles done by inexpert hands using the finest tools money can buy. 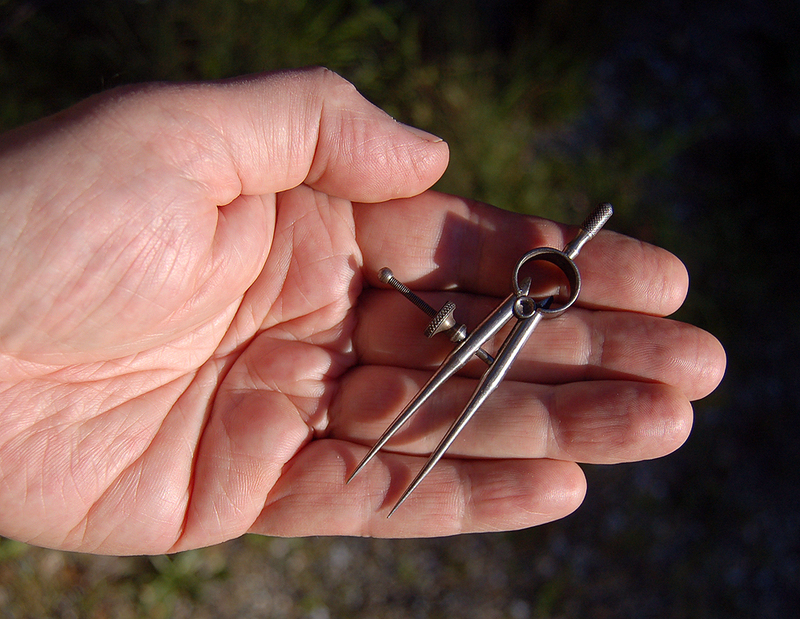 The 3-square jeweler's needle file is triangular in section; it's not square. I love the term "3-square," even though it makes no sense. The larger is about 6" OAL, with a working surface of about 3". 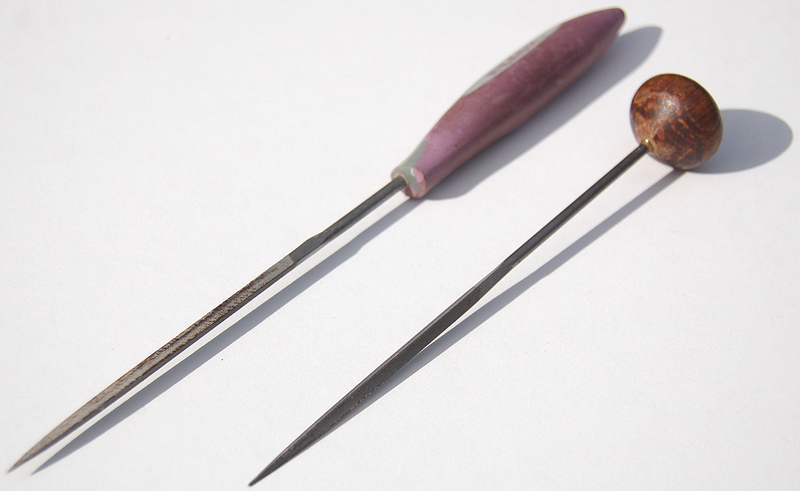 It's a #0 cut, which is fairly coarse within the range of needle files—#00 is coarsest, and the finest is supposedly #8. I don't believe I have ever seen, much less used, a needle file finer than a #4, which is good for very refined work on gold and platinum. Bone, ivory and so on, usually need an "0" cut. I use this to start larger slots accurately, and even do slots for very heavy plain strings and very light wound strings. The #0 cut really cuts quickly, and that cut is too coarse for most plain strings on instruments. It makes a good firm first cut, but with the exception of, say, an .022" guitar G string, you would want to refine the cut later with a more appropriate file. I also use a finer one (the one with the round ball handle) that's about 5-1/2" with a 2-1/2" cut length, or working surface, in a #2 cut. This will do .008" string slots and with a little rocking, up to maybe .018"
Round tapered "jeweler's" files are next. 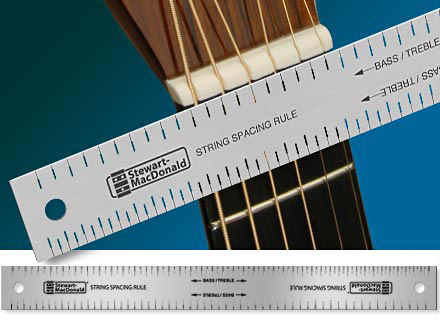 Again, the useful size for the luthier's shop are a larger one (for strings from low A's on guitar to cellos) and a smaller one, which will take you from the typical guitar A down to about .020"w strings. This is actually an escapement file, not a jeweler's file. It's made for cutting steel in watch and clock gears, so it's tougher and lasts longer than typical jeweler's files. The square shank tells you its an escapement file. They run about $20 apiece. I can't find this file in Grobet's own catalog, though mine have Grobet stamped right on them. A few other vendors sell them; Google "escapement file" but know that many of the ones you see are just round tapered jeweler's needle files. Check the shape of the shank: you want a square one. Claro? The tips of these do a sweet job of an .020" slot. 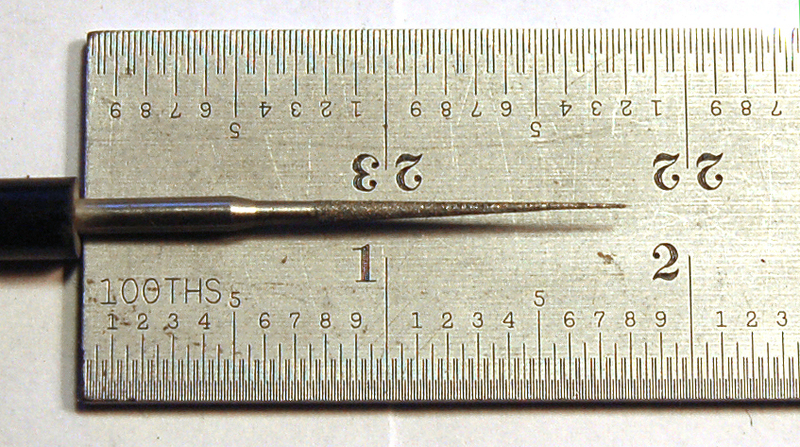 Note the square shank. 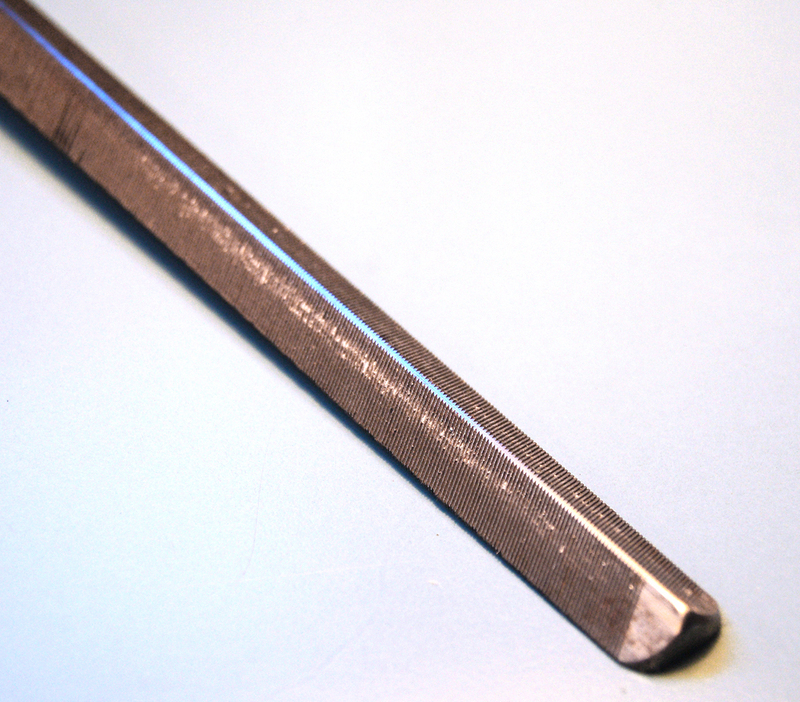 Here's a final slot cutting tool that many folks have not encountered: a diamond-coated tapered round file. I get mine from Rio Grande. It's meant for opening the holes in pearls. 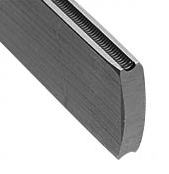 The cant saw file was originally intended for sharpening "M" type hand saws. The good size is 6". 1) the two simple acute edges are great for starting or roughing in large slots: cello strings, fatter guitar strings and so on. 2) with the ends blunted and polished, and with the oblique-angle spine ground and polished safe, they are terrific for crowning frets and dressing the ends. Doing the end is critical if you're working on fret ends on a fingerboard that's flat on a top. Of course you'd have that area masked anyway, but rounding those leading edges makes the end of the file skid, rather than dig in and possibly penetrate, the masking tape if you have an 'oops." Prepared cantsaw files have a third major use, which is to chamfer the front edge of the nut prior final polishing. For this, I lay a piece of tape across the board just in front of the nut, and relieve that edge in a couple of passes. Most of the files on the market now have a lozenge shape that's too flattened; my veteran here (made by the Swiss outfit called Baiter, very hard to find) is just right. Miraculously it's still working after more than 45 years. I save it for dressing really tiny frets. The handle here is a piece of brass tubing, as the original tang snapped decades ago. I have tried to adapt square files with safe edges to do the work of these flattened files and they don't quite do the job. 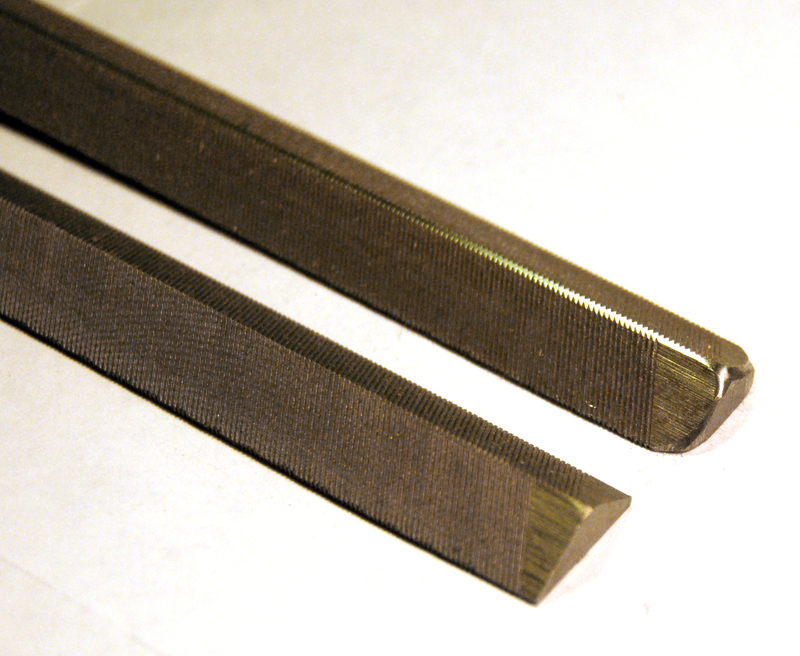 The typical files sold by the luthier suppliers (right) similarly make big messes. I have found that I can dress a cantsaw file with a slightly broader safe edge and it can chamfer and dress the lengths of frets as well as chamfer the ends quite well. Part of this is the tool, the more important part is the technique. The cut, or how fine or rough a file is, is not only indicated by its specified cut, but also by the cut length. (Long files are usually used for rough work on large surfaces, while short files are primarily used for fine, precise work.) So a short file has a finer tooth pattern than a long file with the same cut. And Switzerland is not Germany. As German-born Albert Einstein would hasten to add, it's all relative. Make sense? If not, you're not alone. If you have any other great sources, I'd love to hear about them. Accept no substitutes. The most infinitesimal twist of the wheel results in the solidest and most meaningful mark from point to point. Don't go near a mandolin or a violin without one of these. Odd that they displayed it with such a miserably cut nut, but it's a tool you can certainly do better with. They are terrific with 12-string guitars, mandolins, and the like as well. Speaking of which, check my page on cutting nuts right here. Or, go back to the repair index page.